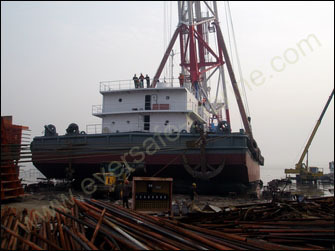 Using airbag launching technology Eversafe marine successfully launched a 1505 tonnes pile driving barge for CCCC Harbor Engineering Company on 4th June. That floating pile driver is 48 meters long,22 meters wide and its molded depth is 4 meters. The designed maximum heavy piling it can drive is 55 tonnes. 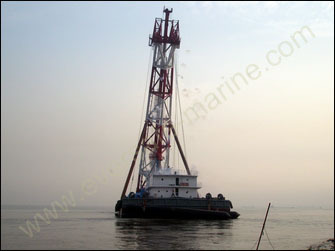 Pile driver has very high pile holder structure which causes its vertical gravity center to be higher than common vessel. Then during airbag launching process, people must control the vessel’s tilted angle. And the unbalanced weight distribution of pile driver also need airbags to be arranged carefully. Eversafe team made two launch plans according to the different launch conditions. Each plan was calculated carefully to avoid any safety problem. 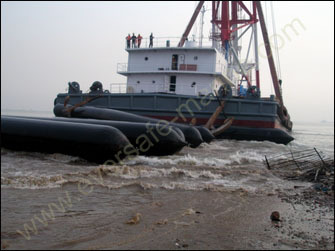 On 4th June when all the launch preparation works were finished and water level reached the demand height, people chopped up holding wire ropes to release the vessel. The pile driver entered into water with rolling bags smoothly. Total launch took 50 seconds from the launch start to vessel float. Some measure instruments were deployed to test the launch. The test results of tilted angle during vessel launching is much bigger than the expected. Then Eversafe engineers surveyed the launching area thoroughly and found some data provided by shipyard were not accurate. 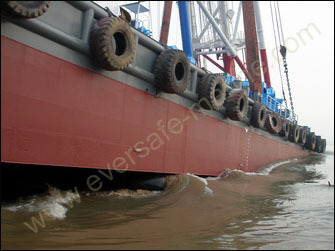 Even the launch is successful and safe, we still take this project as a big warning: no matter how rushed project it is, important information must be confirmed twice by two engineers from Eversafe and shipyard.